Can the Panthers earn an at large playoff berth? 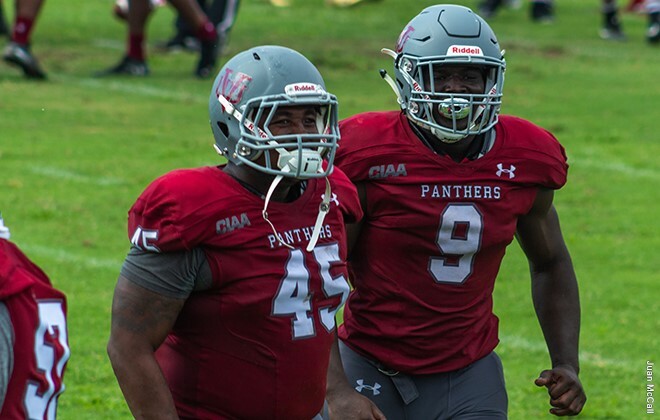 Charlotte, NC–Virginia Union University senior Darius Taylor and his Virginia Union teammates did their part. Now, the Panthers will see if it was enough to earn a spot in the Division II playoffs. Taylor threw four touchdown passes as Virginia Union annihilated CIAA foe Johnson C. Smith 60-6 on Thursday, November 8, in Charlotte, N.C. The Panthers (8-2, 7-1) are hoping to earn an at-large berth in the D-II tournament. The field will be announced Sunday, November 11, at 5 p.m.
Thursday’s game was a makeup game for one that was postponed due to Hurricane Florence. Taylor completed 13 of 27 passes for 226 yards as VUU rolled up 490 yards of offense to 118 for the Bulls (2-8). Tabyus Taylor carried 23 times for 128 yards. Olu Izegwire caught three passes for 74 yards and two touchdowns, and Lavatiae Kelly, Jaeren Burch and Rodney McKay also snagged TD catches. Defensive back Sterling Hammond was the Panthers’ defensive star, scoring on an interception and on a fumble return.